For Sarge and for the entire Shriver family, almost everything in life is a family affair, and their passion for life and work leads them to tackle both with gusto. As a leader in international organization such as the Peace Corps or Special Olympics, interacting with diplomats, as a delegate to the national Democratic Party, as a partner in his Washington, DC law firm, or as member of his local church congregation, Sarge instinctively treated all people as valued brothers and sisters. 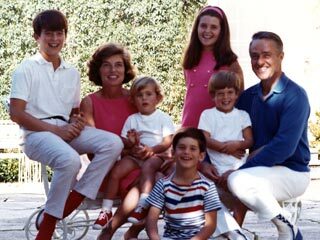 However, his regard and affection were never as evident as they were when he was at home with his wife Eunice Kennedy and their five children. After taking their wedding vows at St. Patrick's Cathedral in New York City in 1953, Sarge and Eunice's partnership became both personal and professional, sharing the efforts toward making theirs an inviting home, the great responsibilities and endless joys of parenthood, and the impassioned work with Special Olympics. Within their home, they shared the belief that their greatest blessings in life were their children: Bobby, Maria, Timothy, Mark, and Anthony. Combining his instinctive parental love with worldly experience, Sarge eagerly embraced the many roles of fatherhood as rule maker, mentor, confidant, playmate and prankster, coach and cheerleader, and, most importantly, as an example of the ideal that every person can serve, every person can make a difference. --Bobby Shriver and U2's Bono co-founded ONE and (RED). The organization has strategically invested in AIDS-stricken African nations and launched advocacy efforts to ensure better public health accountability among them. Bobby has also been a driving force in a highly successful series of holiday CDs titled, "A Very Special Christmas" which support Special Olympics and are now in their second decade of production. --Maria Shriver, journalist, author and former First Lady of California, is one of America's most committed women's empowerment and public service activists. Her Women's Nation initiative and reinvention of the role of California's First Lady has put 21st century women's issues at the forefront of American culture. In that spirit, she also transformed the California Governor's and First Lady's Women's Conference into the premiere women's convening event in the world. Simultaneously, she continues to be a highly effective advocate for a host of social programs and initiatives, appearing at diverse events and broadcast media - all in service to humanitarian causes. --Timothy Shriver leads the Special Olympics as its CEO, expanding the organization to reach 3.5 million athletes with 226 Special Olympic programs in 170 nations across the globe. In so doing, he has helped to reshape national conversation about the spirit, skills and potential of those with intellectual disabilities. Acclaimed campaigns through the Special Olympics, including "R-word," promote respect and fight demeaning language that hurts millions of people with intellectual disabilities. --Mark Shriver serves as head of US Programs for Save the Children Action Network, one of the most powerful and extensive anti-childhood poverty organizations in the United States. Shriver built the organization's literacy, early childhood education, anti-obesity and disaster response programs into the nation's premiere public-private anti-poverty efforts. The organization reaches 75,000 children in the most remote and forgotten parts of America and achieves extraordinary results, setting the kids it serves on a path to a brighter future. --Anthony Shriver is the founder and chairman of Best Buddies International, an organization dedicated to establishing a global volunteer movement that creates opportunities for one-to-one friendships, integrated employment and leadership development for people with intellectual and developmental disabilities. Shriver created Best Buddies while he was a student at Georgetown University.